Fall is here and that means quilt classes! 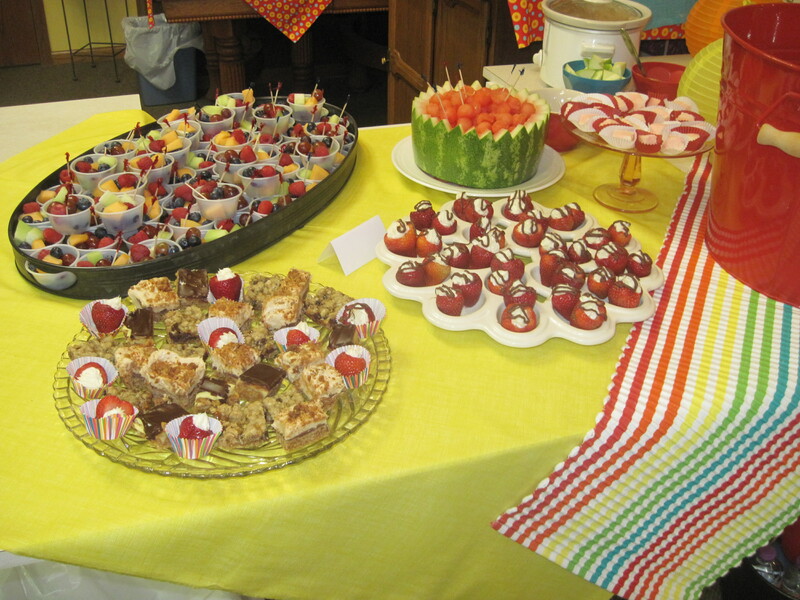 The girls at Gathering Friends have been working hard on class samples. For those who want to learn quilting we have a Beginning Quilting on the schedule for two Saturdays, October 19 and November 2 from 9:30-noon. 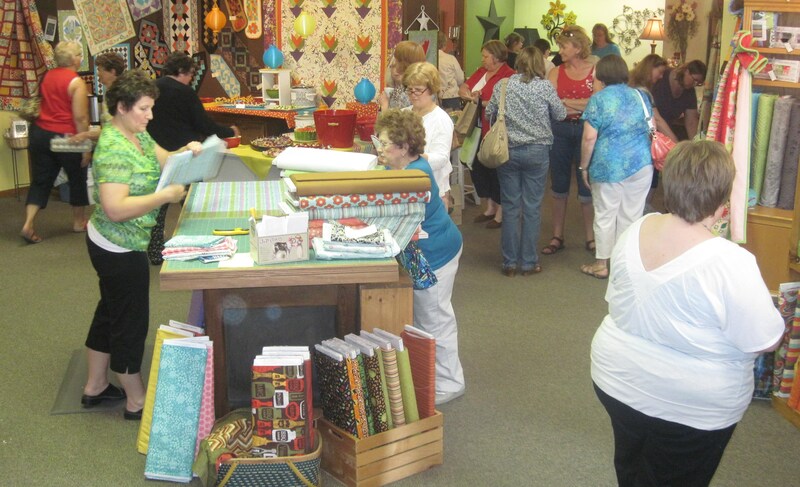 You will learn rotary cutting, pattern reading and accurate piecing and border application. The applique class on October 24, 5:30-8:00 will teach machine applique basics. Tapering your leaves, making perfect circles, are an added bonus to this class. Lil’ Runner is a folksy runner. This is just a fun class to perfect your piecing skills. The class will be held 5:30 to 8:30 on October 29. For this class you will want to precut your fabric before class so in your class you will have more time to focus on sewing the project. 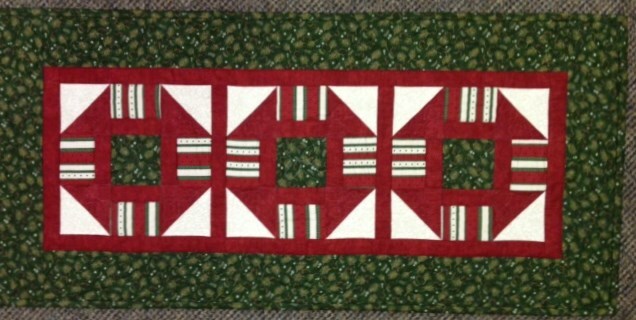 Our most popular class is machine quilting . The evening class is set for October 10. For this class you just need your home machine and freehand foot. You will learn how to freehand machine quilt many designs on your projects and how to follow a stencil. 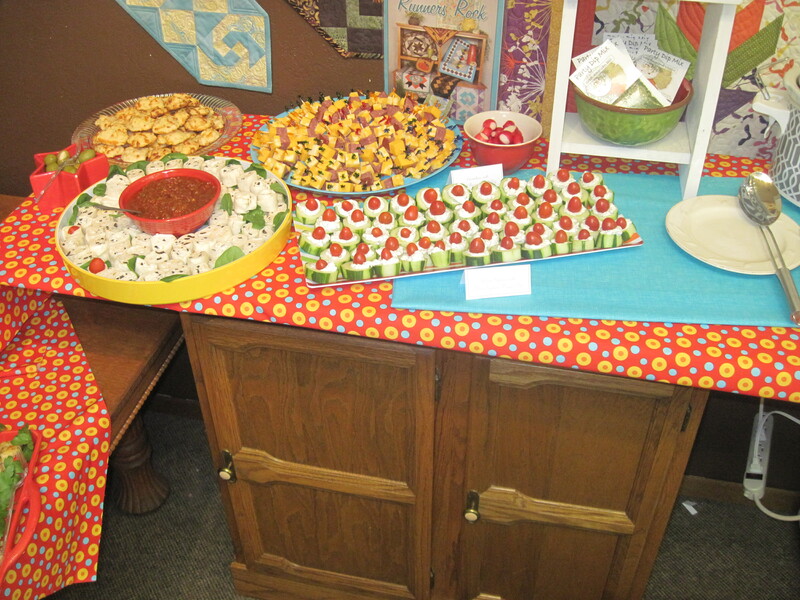 Stop in and see the samples at Gathering Friends Quilt Shop or call us at 320-365-4670 for more details and see more class options. The night was a great kick-off to the summer and our local Island Days. We got to see old friends we haven’t seen in a while, plus make new friends. We had so much fun last night, hence the title to this blog…..First “Annual” Girls Night Out. We’re doing this again next year. What better way to spend a week night~great food, great friends and great fun! My (Kathy) daughter Maggie was graduating from Play Island Prechool in May and I wanted to do something special for her Play Island teacher, Ms. Woller. Originally, I intended to give it to the preschool teacher as a gift from the graduating class. She has been an awesome teacher and made such a positive impact on all the kids. So I had Ms. Woller get a handprint of each of the kids on an 8″ neutral square using fabric paint. She let the kids choose the color and I labeled each block with that child’s name. Luckily the graduating class had 20, which makes for an easy quilt layout~ 4 x 5. If the number was odd, I would have put the year in one block or a class picture or focal fabric squares to fill each corner and balance it out. 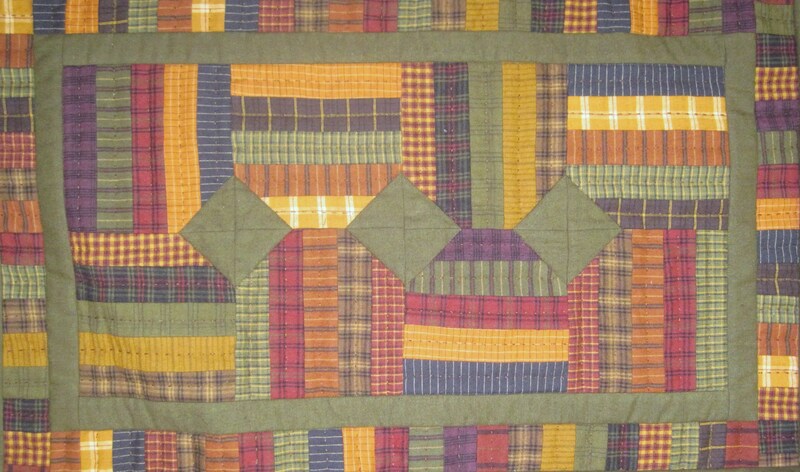 Then the quilt was sashed and bordered with a great print that was very age appropriate. Joyce helped me pick out this great paint splattered piece. The cornerstones helped to keep everything lined up easily. I had to tell Ms. Woller what the squares were for and when she told the board about it, they asked if they could ever raffle it off. So it went from being a gift to a raffle item. No pressure at all!!! The kids had lots of questions about their handprints in paint and what they were for. 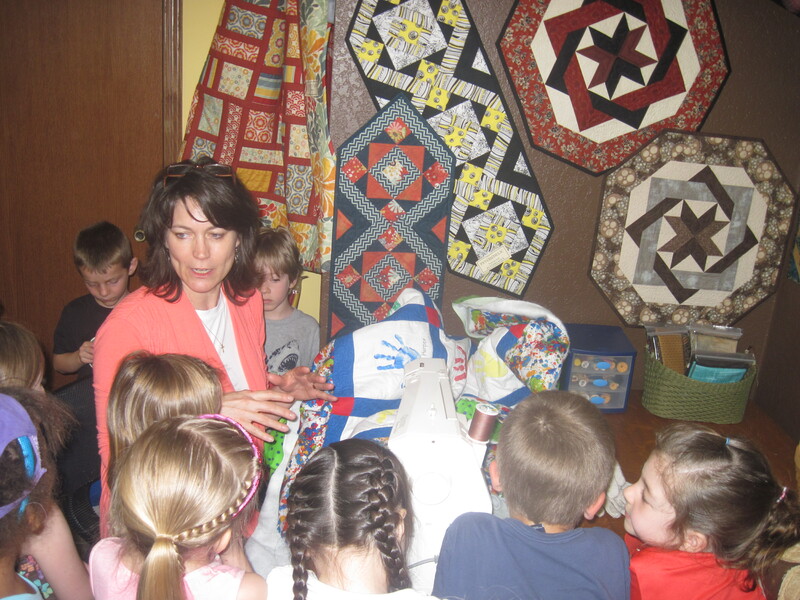 As the quilt came together, anticipation among the Play Island preschool kids grew. It was fun to have them asking about the quilt and seeing the excitement about it. I never dreamt they would be that interested in it. The 2 graduating classes took a field trip to Gathering Friends where they got to pick out colors they would put together, take fabric squares they’d matched up home and see how to machine quilt. But the most exciting part was when I finally showed them the quilt they had helped make. They had so much fun finding their handprints and we loved seeing the pride in their little faces because it was “their” quilt. I showed them how I was machine quilting on it and they had some great questions about quilting and how things are done. It was as much fun for Deb and I as it was for the kids! My favorite part of the quilt was the label. Using inkjet printer sheets, the class photos for the 2 graduating classes were put onto fabric and serve as the label. The very best part of all this was the night of graduation. 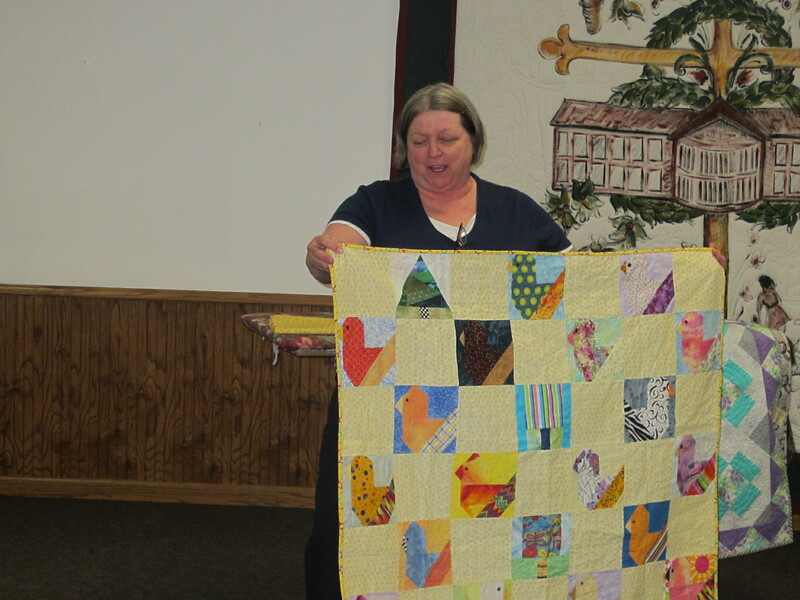 Once the quilt was raffled off, the mom who got the quilt walked up to Ms. Woller and gave it to her. So essentially, the quilt had come full circle and ended up right where it was meant to. Ms. Woller will be diplaying it on the Play Island Preschool room wall for everyone to enjoy! It’s time to start thinking about the County Fair Quilt Challenge. We have our fabric cut and bundled together with the Challenge Rules. Pick one up and try your hand at some creative quilting. We’ve had some awesome entries in the past and everyone continues to amaze us with their flair and originality. From beginners to experienced, all the entries are so fun to see. Be sure to get your fabric before it’s all gone!!! The packet of fabric and rules can be picked up at Gathering Friends. Limited supply will be available. 1. $5.00 non-refundable entry fee, with the entry fee you’ll receive your challenge fabric. Approximate size of piece is 18″ x 21″. 2. Multiple entries per person will be accepted with separate fees and forms for each entry. 4. The size of the completed project must be no smaller than 16″ x 16″. 5. 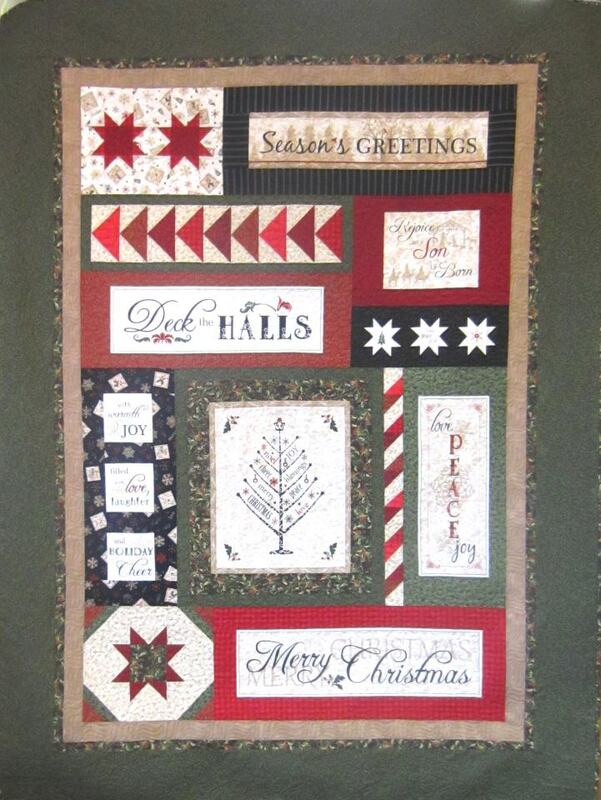 Your project can be appliquéd, pieced, painted, beaded, etc. 6. Your entry must be hand or machine quilted and bound. 7. Entries will be judged on originality, creativity, visual impact and workmanship. 8. All entries must be labeled on the back of the quilt with the title of the entry, contact information and same full name and address that appears on the entry form. 9. The deadline for submission will be Monday Aug 12, 2013. No late entries will be accepted. 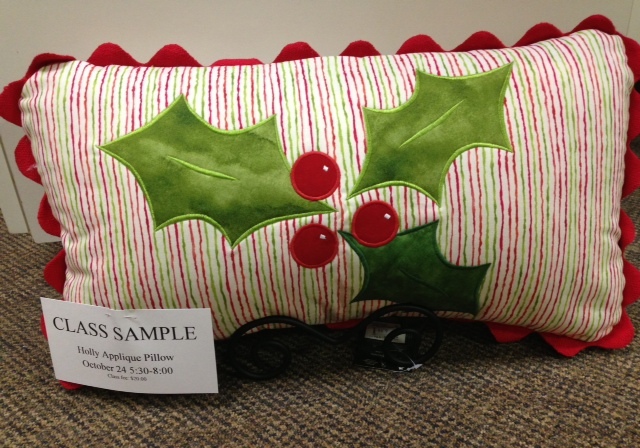 You can drop them off at Gathering Friends Quilt Shop, 101 South Main St, Bird Island. Your project needs to have the registration form completed and attached. The top picture is the finished product and the bottom picture was the quilt in progress. What a classy Christmas look!! The finished quilt measures 65″ x 86″. The block of the month starts June 1st and you’ll get instructions the first of every month for 6 months. 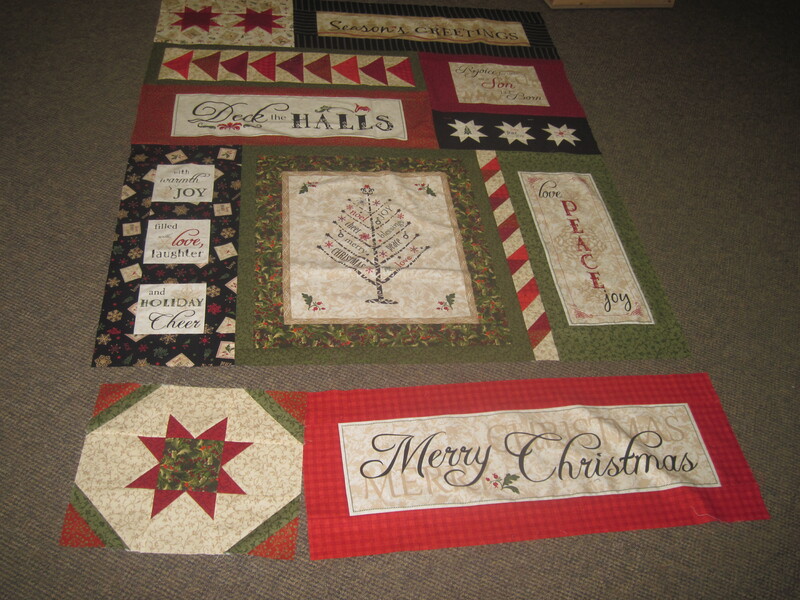 Each month you’ll receive instruction for a pieced block and a panel block. It’s $20.00 a month and the last month, which is November 1st, you’ll receive the last instruction plus all the border fabric and binding. Some people want the whole kit all at once, so that’s another option. The price is $120.00 to get it all at once. We already have a sign up and there are limited quantities, so if you want to be included on the sign up for June 1st, e-mail the store and we’ll e-mail to let you know as soon as it’s ready. The e-mail is info@gatheringfriendsquiltshop.com. Have a great weekend and hopefully your gardens are planted so they can drink in the rain they’ve forecasted!!! Wow how the month of March has flown by!! It’s looking like it will go out like a lamb. That’s what we’re hoping for, albeit a muddy lamb. Much like our yards, vehicles and children! So here’s a surefire way to stay away from the mud….stay in the house and quilt til it dries up!! Ok, so that’s not realistic…it sounds like a great idea in theory. We will have some new reading material for you next week. Runners Rock is at the printers and will be arriving early next week, so those of you who have pre-ordered can start watching your mailboxes. We have the new runners from the book pinned up on the wall. We’ve already been redoing the patterns in different color ways to see how much it changes the look of the project. 2 weeks ago we had people in the store vote for their favorite runner and get a chance to win a free book. The winner of the free copy of Runners Rock is Judy Zuidema. Congratulations, Judy!! Watch for some fun mail~~coming soon! 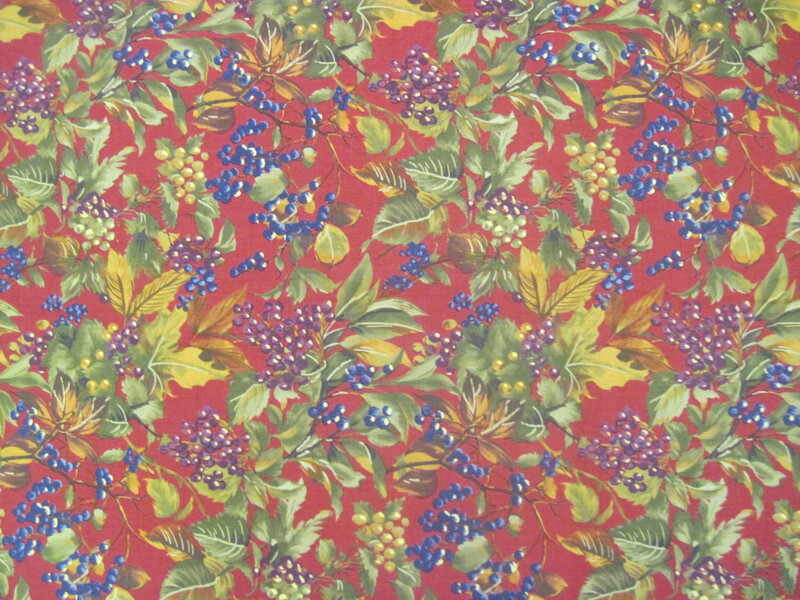 We’ve gotten some fun fabric in the store this past week. The PB&J line from Basic Grey has been so much fun to work with. Kathy is already working on a runner with those fabrics. We also got the kids line in from Moda called “Oink a Doodle Moo”. Sue is working on a quilt right now from that line and we’re putting together the soft book to go with the panel. The patterns are in the store. We figured this was a great line for us here in farming country! Now onto our final March Madness Friday Special. We have all 5 of our previously published runner books on special. Talk about crazy!! Buy all 5 runner books on special and receive 50% off your entire order. Thanks for following us over the past 5 weeks through our March Madness specials and we’ll continue to keep everyone updated with what’s happening in the world of Gathering Friends. Have a blessed Easter and a fabulous Spring!! We made it back from retreat and we’re jumping back into the routine slooooowly. How great to eat, sleep and sew…and do it all again! Then we get home and there was no one to cook for us. Boo!! We had a great time at retreat. It was our first spring retreat and everyone had a good time and got lots done. It was a very productive group! 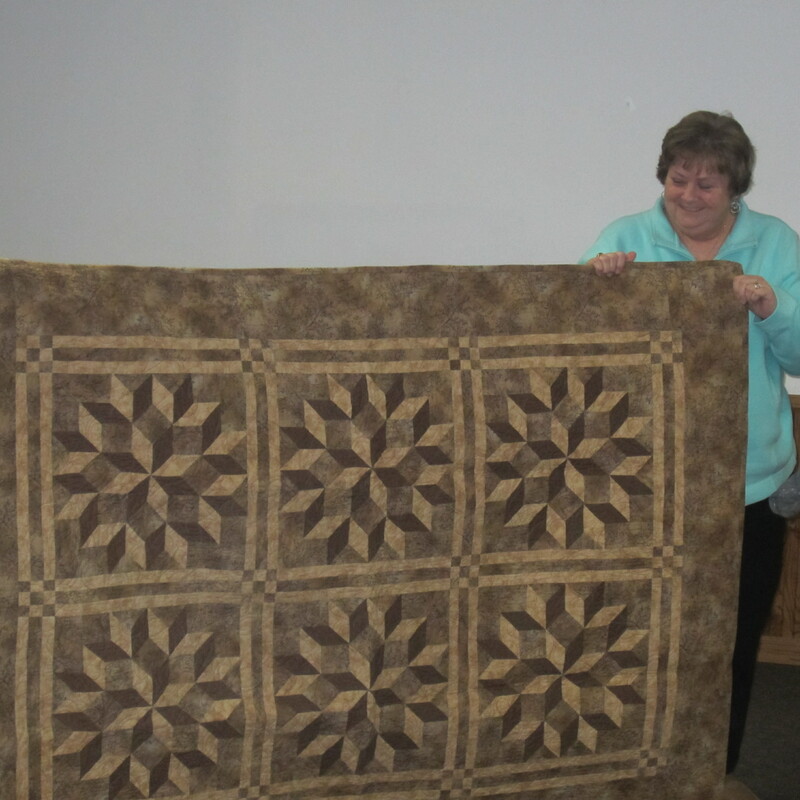 Here’s Shari showing off her Carpenter Wheel quilt that she took as a class from us a while back. Here’s Jane, who loves to get her picture taken. 🙂 She said this was the most fun quilt she’s ever made, a Bull’s Eye made easy. Here’s Marjorie, showing off one of her quilts before she donates it to Gillette Childrens Hospital. She also makes activity bags to hold color books and crayons for the kids there, so they have something to do while waiting for tests and treatments. 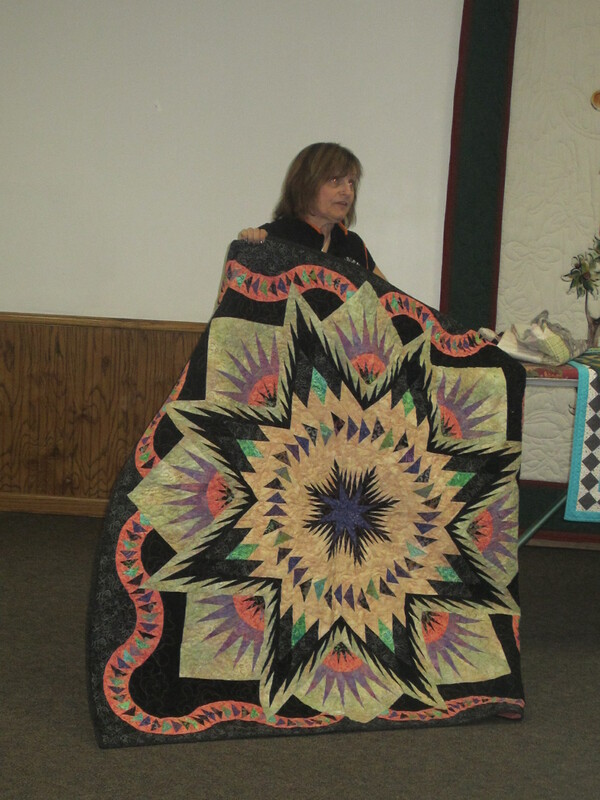 Nancy showing us her favorite quilt to travel with. It just happens to be New Beginnings, from the cover of Quilter’s Peace. The girls, waiting their turn for Show n’ Tell. Everyone looks mesmerized by all the quilts. It can cause visual overload! We always have our fall retreat in November, but it fills so fast, we wanted to try a spring retreat so more people could get a chance to participate. Needless to say, we’ll be having another spring retreat next year. It was such a fun group, lots of laughter sitting by the fireplace at night eating popcorn. Jane and Peg are enjoying the nightly popcorn but still working on their paper piecing projects. Good job, girls! Unlike Cathy, Jan, Elsie, Sue and Kathy….who are just eating popcorn and yakking! Poor Marjorie stayed up much later at night sewing and it looks like she missed us!! We just couldn’t make it til 3:45 am!!! We all loved the fact that we could watch out the window at the storm whipping across the lake and not have to worry about getting anywhere…except to bed. We had a small project this year called “Paper Pieced Posies”. The girls learned how to paper piece, appliqué and make yo-yos with a new tool. The project is going to be in our new book “Runners Rock”. We had 2 color ways to choose from; warm, cozy colors or pastels for spring. Adorable!! We had a great group to quilt with and enjoyed every minute. We will definitely be doing this again! We already booked our dates for next year. The spring retreat will be March 16 through the 19th, 2014 and sign up begins November 1st, 2013. Enough about the retreat, onto our March Madness fun for Friday, March 22nd. This Friday order ANY Gathering Friends patterns from 12:01 am to 12:00 midnight and receive 30% off each pattern that your order or come in and buy. Have a great day and enjoy the weekend!!! !